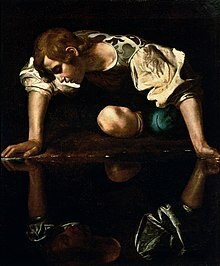 Narcissus bi Caravaggio depicts Narcissus gazin at his ain reflection. In Greek meethologie, Narcissus (Greek: Νάρκισσος, Narkissos) wis a hunter frae Thespiae in Boeotia wha wis kent for his beauty. He was the son of the river god Cephissus an nymph Liriope. He wis proud, in that he disdained those wha loved him. Nemesis noticed this behaviour an attracted Narcissus tae a puil, whaur he saw his ain reflection in the watter an fell in love wi it, nae realisin it wis merely an image. Unable tae leave the beauty o his reflection, Narcissus lost his will tae live. He stared at his reflection till he died. Narcissus is the origin o the term narcissism, a fixation wi anesel an ane's pheesical appearance. ↑ "The myth of Narcissus". This page wis last eeditit on 24 Juin 2016, at 22:55.